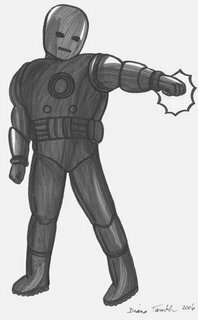 I wanted to do the old Iron Man, because frankly - he's cooler. It's been a loooong time since I last did a super hero drawing, the last one I remember was a Sword of the Atom one I did in high school (I loved that mini-series). Anyway, here it is. It also marks the first time I used Pitt pens, so it was a bit of a learning experience. In other news, Dan Brown from the London Free Press plugged my stuff on his blog. P.S. Hi to Dave and Rosie! Glad you like the drawing! It was custom made for you, so we just need to figure out how to get it to you! Say hi to Claudia!